... covers central heating of the house as well, you should choose a Compact P solution with an outdoor air or ground source heat pump. 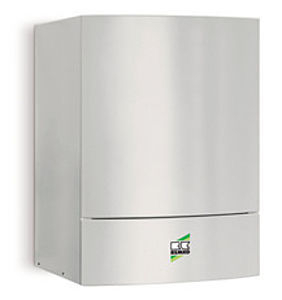 Reversible heat pumps can be geothermal or aerothermal. Heat is extracted from the outside air, the ground, or groundwater. These energy sources are free and inexhaustible. ArchiExpo features reversible aerothermic air/air and air/water models, as well as geothermic water/water or water/air versions. These units can be found in housing, offices shops and other settings. Such devices effect thermal transfer using a refrigerant fluid. They can both heat and cool, providing year-round interior comfort.